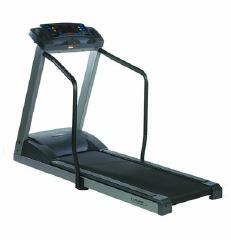 The Trimline T370 HR treadmill is the high end heart rate model from Trimline. It is the company’s most expensive HR unit but it is also their most powerful home treadmill. This treadmill is perfect for those who want a powerful treadmill with heart rate features. However, it is priced above $2,500, so most can’t afford it. But if money is not an issue to you then this model might be the one you’re looking for. This unit has the most powerful motor in all of Trimline’s home treadmills. It boasts a 3.0HP continuous duty US made drive motor that can reach up to 11 mph and 12% incline. The 7 preset and 3 custom programs give you more workouts to choose from. Or, if you want, you can use the heart rate chest strap and do any of the 2 heart rate programs that are also built into this treadmill. The 10 x 21 tri-color dot matrix visually displays course profiles to see upcoming hills and other challenges while the LED displays provide feedback on time, speed, distance, incline, calories, pace, cal/min, and heart rate so you’ll know all the information you’ll need to adjust your workouts. The 20" x 57" reversible phenolic deck surface features an orthopedic belt. This belt is softer than ordinary belts, but the problem with it is that is causes more wear and tear to your machine. But the good news is that the Trimline T370 HR treadmill provides even longer warranties compared to other Trimline units. This treadmill comes with a 30 year frame and drive motor warranty, 3 year parts warranty, and a 2 year labor warranty. Both the parts and labor warranties were extended by 1 year for this unit. Just like the T360, the biggest weakness of this unit is its heavy price tag. The ortho belt is also a weakness since it may cause some problems in the future. But that is unlikely since this machine is of high quality and besides, the warranty will take care of any repair expenses when needed. I do not recommend the Trimline T370 HR treadmill. It may be the most powerful in the Trimline line but when compared to others in its price range, you’ll be better off buying from a company which specializes in high end treadmills. Warranty: residential warranty of 30 years - frame & drive motor, 3 years - parts, 2 year - labor. If you plan on buying a Trimline T370 HR treadmill, I suggest you buy it at amazon. You can get it for $2,698.00.